Why do Hindi cinema superstars flounder in their fifties? asks Vanita Kohli-Khandekar. 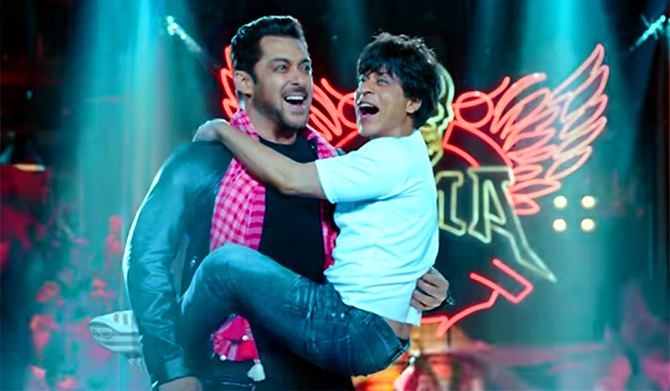 IMAGE: Shah Rukh Khan and Salman Khan in Zero. Shah Rukh Khan's Zero, released late in December 2018, hasn't done well. The story of a vertically challenged man in love with a scientist with cerebral palsy is about imperfect people and how they find completeness. It is Khan's third film after Fan and Jab Harry Met Sejal to meet with a tepid response. The 53 year old is India's biggest star. His body of work spans more than 100 films with over 60 as a leading man. Many of these -- Dilwale Dulhania Le Jaayenge, Kuch Kuch Hota Hai -- are among the biggest grossers in Indian cinema; so a couple of unprofitable films isn't a big deal. The real question it throws up is why do Indian superstars flounder in their 50s? From Dilip Kumar (96) and the late Rajesh Khanna to Amitabh Bachchan (76) and Shah Rukh Khan every one of them has gone through this -- they hit 50 and their films start going all over the place. Even their good films, say Fan for Khan, can't seem to find a market. This is true even for female superstars in Hindi cinema such as Madhuri Dixit and Sridevi. 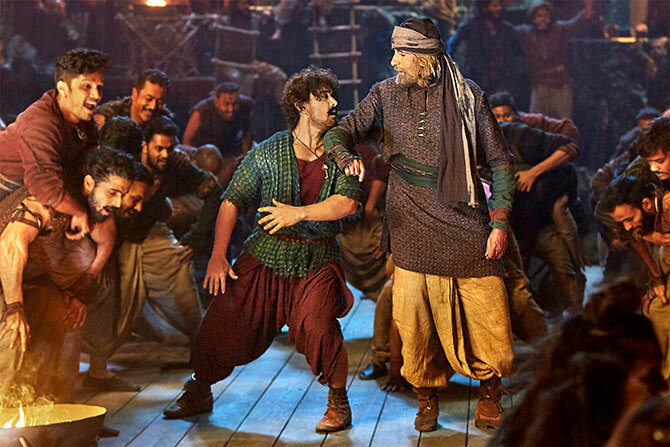 IMAGE: Aamir Khan and Amitabh Bachchan in Thugs of Hindostan. The only difference is it hits women in their late 30s, early forties. It is probably an area of study for a cinema scholar but here are my two bits. Indian cinema was too dependent on the hero-heroine story. There had to be a leading man and it had to be a saleable actor. Dilip Kumar or Bachchan were well past their 50s when writers continued to pair them with women who looked way younger on screen. Because there were no other saleable stars. It was critical to have a Bachchan to get the audience in the theatre -- that is why he was called a one-man industry. It worked till he was young and the stories made sense. By the time cable television came and options increased, Bachchan had aged. He struggled with heroines like Meenakshi Seshadri in forgettable films such as Shahenshah (1988) and Toofan (1989). IMAGE: Amitabh Bachchan and Parineeti Chopra on Kaun Banega Crorepati? In 2000, after he hosted Kaun Banega Crorepati, as himself, a 57-year-old, writers rediscovered Bachchan. Baghban (2003), Piku (2015), Pink (2016) -- are among a dozen examples of the resurrection of Bachchan's career. Dilip Kumar did some of his major flops such as Bairaag (1976) and Sagina (1974) among others soon after he entered his 50s. He finally got roles which had him playing his age in several 1980s hits such as Mashaal, Mazdoor, Shakti or Karma. These were strong author-backed roles, but the 'hero' of the film was always a younger person. The whole idea of doing stories around a bunch of characters all of who have a role to play in how the story moves, is now coming to fore. The economics of film-making has changed moving away from the one revenue stream (box office), one man, hero-dependent (Dilip Kumar or Bachchan) times. Also, there is no longer any stigma attached to playing a father, brother, mother et al. One of the biggest hits of 2018 is Badhaai Ho that is about a middle-aged couple's accidental pregnancy. 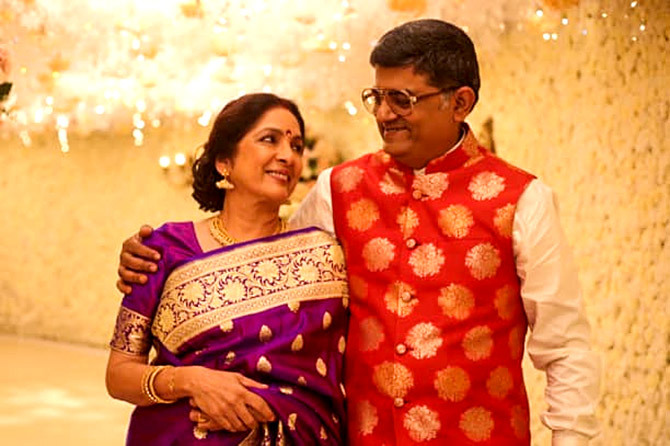 IMAGE: Gajrao Rao and Neena Gupta in Badhaai Ho. You could argue that Tom Cruise (56) is edging towards 60, but nobody expects him to not be Ethan Hunt (in the Mission Impossible series) or Jack Reacher, roles that are full of action and stunts that Cruise insists on doing himself. That is where a comparison with superstars from South India is useful. Sreedhar Pillai is a Chennai-based film critic and expert. He reckons that Hindi superstars are largely romantic ones, but the ones in the South are more action oriented -- like Chiranjeevi in Telugu cinema and Rajinikanth in Tamil. "Action heroes survive (the scourge of the 50s)," thinks Pillai. That explains why Salman Khan and Akshay Kumar are not having as bad a time as Shah Rukh seen as a romantic hero. But it doesn't explain why Bachchan, who was seen as the original angry young man and action hero, struggled. Much of this throws up a piquant question -- does the market tend to punish superstars who experiment beyond their core proposition? So Shah Rukh is finding it difficult to get audiences to watch him as a crazed fan (Fan), a bootlegger (Raees) or a robot (Ra.One). His earlier attempts at breaking out of the romantic mould -- Swades, Paheli (both 2004), Chak De India (2007) or My Name is Khan (2010) -- too had mixed results. Let us wait till his next big hit when the new theories will be written. Are the Khans finished at the box office?